The aparthotel has an outdoor pool with terrace and sunbeds and a small playground, or enjoy a drink in the pool bar or café. All studios are set over the 9 floors and are comfortable and well furnished with good conveniences. Sheets stained with blood, yellow and with pubic hairs! On arrival we were asked for a 100 euro deposit when booking.com states it was 50 euros. The bed sheets were filthy with yellow stains, blood stains and pubic hairs. There was one hand towel for two people to wash with for a week. The microwave, toaster and iron were all missing. Reception said they didn't provide that equipment anymore and there were no clean sheets or towels. Booking.com could not get anyone in charge to speak to. Eventually they got Kayley and we were told to speak to her at 11.10am. On doing so she informed us the sheets were clean and towels had been in the room. She couldn't explain the missing equipment. She said she would decide if the sheets were dirty and if we would get clean ones. A family member who lives nearby, looked in on us and asked what was wrong. He was told by Kayley "if you don't like it there's the door ". She then had a conversation in Spanish with her colleague, calling me some form of name. We cut our loses and as we had not been able to speak to her until 11.10 she charged us two nights as checkout was 10.30 am. We moved to the Levante Lux down the street. What a difference, clean, friendly, Wi-Fi and air conditioning in the room. Avoid this place at all costs!! Hi we've stayed here 5 times in the past and find it ideal for our needs. The rooms are cleaned every day and the maids leave fresh towels as long as the used ones are put into the bath. I've stayed in four star hotels and only had the towels changed once. The pools great and a decent size and the bars nice and friendly. The staff leave you alone to enjoy your holiday and don't hoover round you. Straight up the road behind the entrance is a large supermarket and there's bars and cafes on all sides of you. We walk everywhere as its so central to the beach shops and the English square. This is a good value for money aparthotel. Our board was self catering - with a "Kitchen Area" that was the size of those you used to find in a VW Campervan?. You must be joking. The room itself was very clean with fresh towels every morning. The balconies are all 3 feet in height - very dangerous. The whole building should be condemned really. Its location is very good - 5 minutes to the beach and 2 minutes to the start of the bars leading to the Square. The staff were ok. The entertainment was a pianist on an electric organ. 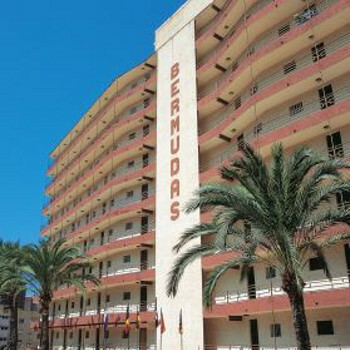 We wouldnt stay here again- we didnt feel safe, there are plenty of better places to stay in Benidorm for the same price. I stopped at the bermudas for 10 days, the cleanliness of the apartment was poor. On arrival on the living room floor we found a dead cockroach, that wasn`t so bad but through the week two others attended the funeral. Also through the week I dropped a peice of chicken which I forgot to pick up. The next day it was sorrounded by an army of ants which lead a trail into a hole in the wall near the fridge. The hotel staff were ok, and the pool and surrounding area was well above average. We were self catering so I cannot comment on the food, although when we sat in reception next to the dining area, the most I saw eating was about six people, and I think three of them were the cooks. I never stopped to watch any entertainment and when I left I heard there was an accordian player on every night. I was so sorry I missed that [NOT] I would not stop in this hotel again, but I did not let it spoil my holiday. Thoroughly enjoed my holiday and I would reccomend Benidorm to any one no matter what your age group as our friends were a lot older than us. I had read reviews on this hotel and expected it to be a bit of a dump! on first impressions, it was in desperate need of updating, however I found it exceptionally clean and no problems with the basic facilities. I found the two daytime receptionists friendly and helpful, but their was an elderly gentleman who usually worked on the evening who was very grumpy and made us feel unwelcome. We never tried any food as the pool side bar was never open, however drinks were cheap and served by a friendly bar man. there is some great bars nearby but we always got a taxi (high heels)which were very cheap and the drivers that we had spoke good English. There is also a subway two minutes walk around the corner. We only stayed in the hotel for 3 nights, and I would stay their again for a short break. When we arrived at the hotel the staff were very rude to me and my friend didn't seem like they wanted to welcome you. When we arrived in the room I took a look around it was meant to have a kitchen in it but we was told not to use the oven as it's dangerous. The bathroom was a very dirty hair on the floor and rust in the bath. We stayed for 10 days and had booked for half board but after one breakfast of cold meats and a dinner of chicken and fries we ate out for duration of holiday. The rooms are quite clean and clean towels and toilet roll is provided daily, maids were friendly. On arrival we were met by a moody night porter who couldnt find our details and I felt he was quite rude, wouldnt help us into tiny lift with our luggage and we had to go upto 8th floor. Food was very bland and a buffet style dinner is not available they are set meals and everything is served with greasy fries. Meals on offer include beef tripe, onion soup, sardines, spanish salad.The pool is nice very good size and great suntrap in the afternoons. The only entertainment on offer is a spanish man playing the guitar and a spanish lady on the keyboard.